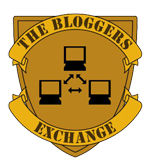 Notepad Corner is now an official member of The Bloggers Exchange, a group of bloggers in a new exchange link program aiming to help co-bloggers in their blogging career in various ways. I am so excited to meet the people behind their pseudonyms personally in the future, whew! They are great writers! I am very glad to be a part of this group! I am so glad to meet you Willa and Anne and am looking forward to sharing and exchanging of ideas as well as meeting the other TBE members! To The Bloggers Exchange, more power and Mabuhay! hello! i am dropping by from the bloggers exchange today. you have a very interesting site. i am following you :) see you around!